The Project brings valuable proficiency training to pilots at venues across the U.S. by combining relevant safety forums with challenging simulator training sessions that address key safety of flight issues. The proof-of-concept Project was offered in 2012 during EAA AirVenture in Oshkosh, WI and included a report published by SAFE based on feedback collected from participants. The Project was then offered during the 2012 AOPA Summit, 2013 Women in Aviation International Convention, and 2013 Sun-n-Fun Fly-in. The first Regional Pilot Proficiency Project™ is scheduled at Skyport in San Marcos, Texas on October 26–27, 2013. In addition to increased awareness and knowledge, the Project offers benefits to participants such as credit for those enrolled in the FAA WINGS program and Accident Forgiveness by Starr Aviation to qualifying pilots. FMI on Starr’s accident forgiveness, see the News Release. Project forums are presented by some of the country’s top aviation educators, including Master Instructors, National and Regional Flight Instructors of the Year, and noted subject matter experts. The simulator training scenarios were co-developed by SAFE instructors and the Redbird team for use in Redbird flight simulators. One-hour training sessions are broken down into a 15-minute pre-briefing, 30 minutes in the simulator, and a 15-minute debriefing. SAFE has made the simulator training scenarios available to all operators of Redbird simulators through SAFE’s Public Resource Center webpage. Regional Projects are weekend-long, fee-based events. 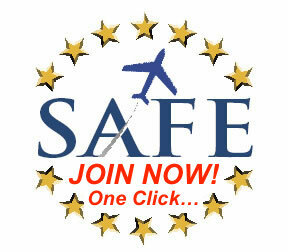 FMI, see the Regional Pilot Proficiency Project™ webpage. Developing and conducting Pilot Proficiency Project™ events requires the talent and dedication of individuals and organizations alike. To ensure access to quality forum presenters and qualified simulator instructors, the Project needs sponsors, hosting partners, and others to get involved in proactively advancing pilot proficiency and safety. If you are interested in becoming a sponsor or venue hosting partner, or if you are a SAFE member interested in participating as a presenter or simulator instructor during one of the Projects, please contact Doug Stewart.